PLESK_ERROR: Unable to locate the document root directory of the website. 1. The FTP user only has access to a directory inside the document root. For example, this can happen when migrating the website http://example.com/ if the FTP user only has access to a subdirectory of the website, e.g. http://example.com/blog. To resolve the issue, specify correct source document root and source website URL in advanced options below. 2. The document root of the website is located more than three levels deep relative to the FTP root directory. For example, this can happen when migrating the website http://example.com/ if its document root directory is /var/www/vhosts/my/sites/example.com/httpdocs and the FTP user root is in /var/www/. To resolve the issue, specify correct source document root in advanced options below. 3. There are rewrite rules for the document root (for example, specified by mod_rewrite and the .htaccess file). To resolve the issue, temporarily disable the rewrite rules. Incorrect parameters specified for Website Import that violate requirements for Site Import feature. If Source document root is specified, Files root should not be specified (should remain empty). www should not be specified because Source website URL is taken from the absolute path on a server: for example, if the document root is /var/www/vhosts/example.com/httpdocs, specify https://example.com in the Source website URL field. 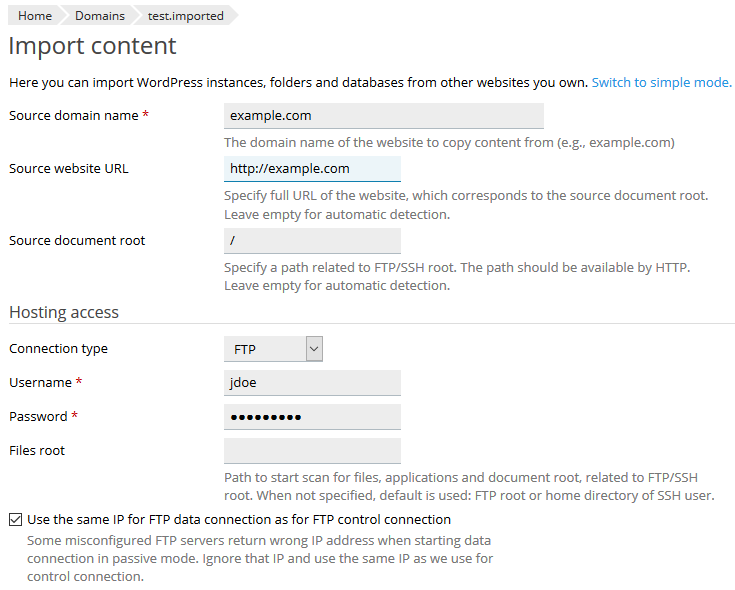 If the document root is /var/www/vhosts/example.com/httpdocs/my/wordpress, specify https://example.com/my/wordpress in the Source website URL field. You may purchase a support subscription. The first month is for free. In case nothing helps, I suggest submitting a ticket to Plesk support to find the cause of the issue. I really don't understand this Tool. This worked only once Plesk to Plesk. Nothing else. No Strato, no 1und1 and Host Europe or ALL INKL. Nothing. Regardless what Settings I set, i tried EVERYTHING. I tried this on several Serves, seems not working at all. There's a connection but nothing more. Second Step always fails. I am not direkt partnered with Plesk.